The preparation for the next release (the 0.8) are in the full speed. Original expected release date was today, but we are not ready yet. It will take at least two to three more weeks. Especially the graphical work on the new terrain has proved to be more trickier than we expected. Last week we had some good sales driven mostly by the people from the US. That had a very positive effect both on our credit balance but more importantly on our moral strength. 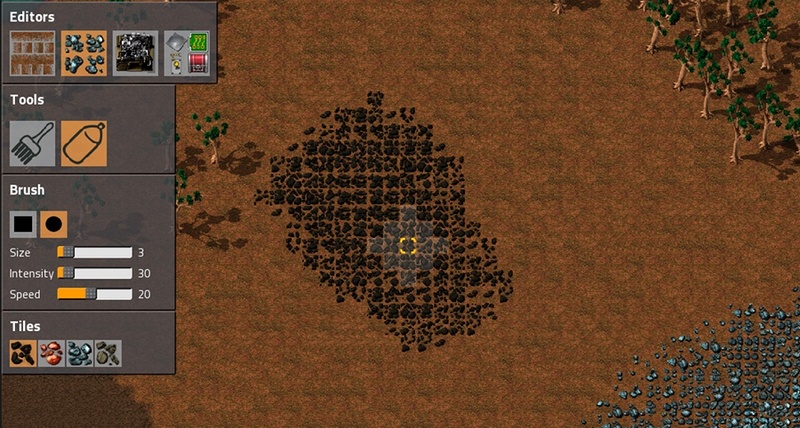 We have been working on Factorio for a long time with a lot of uncertainty regarding the outcome. We keep getting moral boost from people on our forums but actually selling the game feels great. The absolute numbers were not staggering (the peak was at around 50 sold copies per day) but for us they were still high above average (usually it is like 10 copies per day). So the mood is better now, we even went out for some social activities this week. Back to the programming. The repair robots mentioned in the last post are done. Michal is fast:) He spent past couple of days with smaller tasks we had on the list for a while. Now he is fiddling with "ghost" entities (transparent outlines of entities without bounding box). These will be used for reconstructing entities that has been completely destroyed and in the future also for the blueprints. Terrain painting - before only one tile at a time could have been changed. Now there is a brush with different sizes that can change the surface pretty fast. Laying out the resource fields - The biggest pain in the old editor. Resources had to be laid out one by one and then manually increased by holding a specified key. Now the brush or spray can be used to do that in matter of seconds. Creating forests - Not so common, but still time consuming. Creating big forests one tree at a time will be a history by using a brush to draw many trees at once. Copying entity strutures - Moving a part of the factory 10 tiles to the right is not possible now. The plan is to allow some sort of selection and copy-pasting that selection to other place on the map. Inventory manipulation - Chests can be filled only one stack at a time now. I still don't know how, but this will be improved. From the above list the first two tasks are finished already. The rest is work in progress but will be ready for 0.8:). The map editor early preview is below. The tabs at the top left represent different layers(terrain, tiles, entities, items). Below is the tool list. The active tool is the spray which I used to spray the coal field. The usual thread for comments is on our forum.